It’s day 2 of my new pattern releases! (Click here for yesterday’s post about Pieced Primrose). 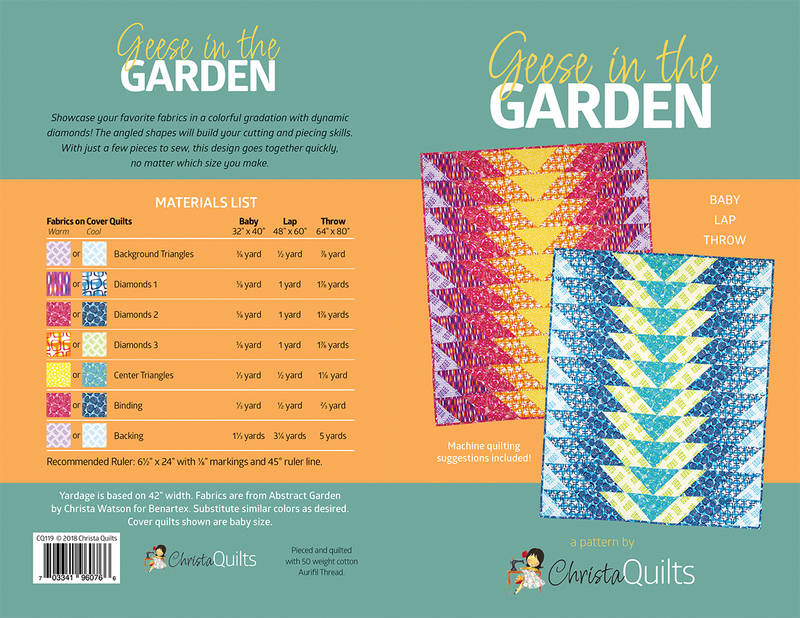 Today I’m excited to share my Geese in the Garden quilts with you! I had the most fun naming my patterns so that they would tie into the Abstract Garden theme of my latest fabric line. I made this design in two colorways – warm and cool. The best thing about this quilt is that it only calls for 5 fabrics! So you can pick and choose and play around with different arrangements of the diamonds to create some really fun color gradations. And the secret to this quilt is that the diamonds aren’t “true” diamonds meaning they are easier to piece than traditional diamonds, AND they will work with HST’s (half-square triangles), QST’s (quarter square triangles) and Flying Geese units, whereas traditional diamonds won’t, because of the funky math involved. In the instructions, I very thoroughly explain how to cut and piece the diamonds with lots of clear illustrations for you to follow. The best part is there’s no specialty ruler required! All you need is a regular ruler that has a 45 degree angle and you are all set. I quilted wavy lines on the warm version. Of course I include machine quilting suggestions, too. For these quilts I quilted irregular wavy lines on the warm colorway and straight lines on the cool colorway. Both are done with a walking foot/dual feed – easy peasy!! I quilted irregularly spaced straight lines on the cool version. I used more of my new variegated threads from Aurifil – pink for the warm and blue for the cool for the quilting. They added a nice touch to the quilt while not overpowering the pieced design. The pattern comes in 3 sizes: Baby, Lap, Throw and the cool thing is that the design doesn’t change between the three sizes. You make the same number of units, but each one gets bigger depending on the size. So this quilt goes together super quick and is the perfect quilt to make when you need a gift in a hurry!